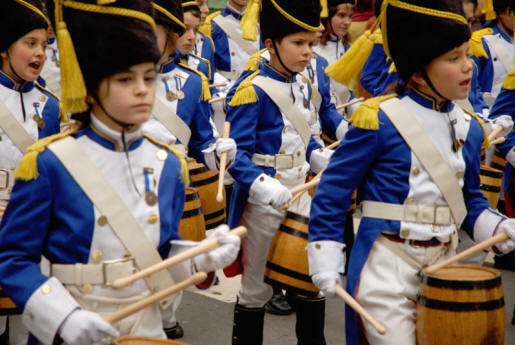 Every year on the 20th of January, the streets of the Basque coastal city of Donostia-San Sebastian are alive for 24 hours with the music of fief and drum as townspeople celebrate the feastday of Saint Sebastian in a ritual known as Danborrada ("Tamborrada" in Spanish). As midnight approaches on the eve of January 20, the Constitution Plaza in the Alde Zaharra ("Old Part") of Donostia-San Sebastián is filled to overflowing with a crowd ready to inaugurate the annual celebration known as the "Danborrada" ("Tamborrada" ins Spanish). As midnight strikes, the mayor raises the blue and white flag of San Sebastián and for the next 24 hours the entire city is awash with the sound of drums. People of all ages, dressed as cooks and soldiers, march around the city. Here is one group laying out their planned parade route in various stages--you have to leave breaks for food and drink! For a pure level of noise during festivities, few things rival the annual Danborrada. The whole town partakes from midnight to midnight as companies of perfectly uniformed marchers parade through the streets of San Sebastian playing drums and barrels in honor of their patron saint, the Donostia of San Sebastian. The activity begins on the evening of January 19th at the Plaza de la Constitution and winds through all barrios of the old city for the next 24 hours (there will be a brief break in the morning around dawn--just enough time to throw back a brandy and some churros). The different corps of marchers represent the many gastronomic societies in San Sebastian, and the competition is fierce for both dress and musical quality. Adults usually have dinner in sociedades gastronómicas ("gourmet clubs"), which provide elements of the procession, and which traditionally admitted only males. Nowadays, even the strictest ones allow women on the "Noche de la Tamborrada". They eat sophisticated meals cooked by themselves, mostly composed of seafood (traditionally elvers, now no longer served due to its exorbitant price) and drink the best wines. 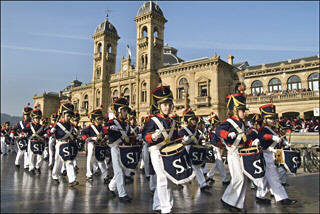 For "Donostiarras" this is the most celebrated festival of the year. Today the marchers parade around in either military or cook outfits. As with many a Basque tradition, the origins of these outfits are vague. One source takes the origins of the military aspects back to the early 19th century from a procession from the Santa Maria Church in the Old Part to the San Sebastian Church in the district of Antiguo. That event finished with a popular dancing accompanied on the military band's flutes and drums. In addition, every day a soldier parade took place to change the guards at the town's southern walls. 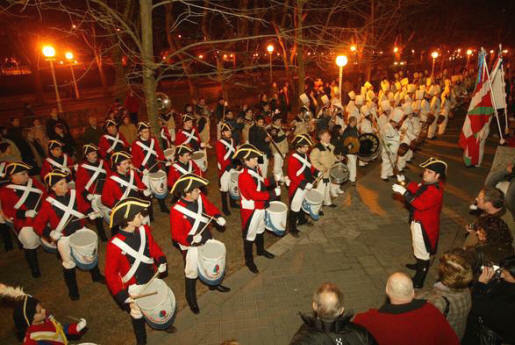 Another sources credits the military outfits from 1881 when unusable military outfits were found and the Town Council decided to grant them to the Union Artesana club for use by their drum-players. Paraders march in either military or chef costumes. 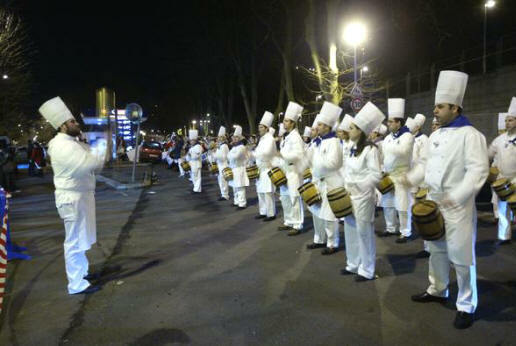 Bakers (nowadays cooks) joined the parades sporting barrels donated by Vicente "Txiki" Buenechea to be used as drums. Other clubs followed suit, the festival taking on at the start of the 20th century the shape of the present-day mixed military and civil style celebration. One story has it that in 1720 a baker was filling water barrels from a fountain near the Iglesia de San Vicente. While filling the barrels he began to sing, and a group of young girls passing by started banging on the barrels as accompaniment. A crowd started to gather and this impromptu jam session evolved into the spectacle you see today. In theory this celebration with the marching cooks and soldiers is to commemorate the feast of Saint Sebastian that the Roman Catholic Church marks on Jan. 20th. Sebastian (died c. 288) was a Christian saint and martyr, who is said to have been killed during the Roman emperor Diocletian's persecution of Christians. 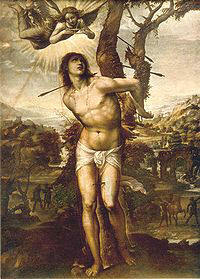 He is commonly depicted in art and literature tied to a post and shot with arrows. Sebastian, like Saint George, was one of a class of military martyrs and soldier saints of the Early Christian Church.